We've had some questions from customers lately about different categories of ceramics as they relate to teaware, and thought it might be useful to post a few guidelines. The history of Chinese ceramics and tea are closely intertwined, as many ceramic forms evolved to facilitate brewing tea. Porcelain was invented in China and Western scientists and artisans labored for centuries to duplicate it. They didn't start to get the knack until the 18th century. A fair amount of present-day confusion occurs because (as often happens) Western and Chinese categories of ceramics don't match up. Chinese think of tao (陶), often translated "pottery" and generally comprising what in English would be called either stoneware or earthenware; and ci (瓷), usually translated "porcelain." Tao are less vitreous ceramics fired at lower temperatures, while ci signifies high-fired, more vitreous products that make a distinctive ringing tone when struck. Adding to the complexity, Chinese like to modify these generic nouns to add clarity, so they speak, for example, of bai ci (white porcelain), qing ci (celadon porcelain), and tao qi (tao ware). A general term for ceramics in Chinese is tao ci. As usual, our Western definitions are more precise, with three broad categories. Here "porcelain" is high-fired and vitreous, with a white body. In addition, what's sometimes known as "true porcelain" is thin-bodied and translucent. True porcelain is contrasted with what's called simply "china," which also has a white body but is softer and heavier than true porcelain and, unlike it, can be cut with a file (not that this is a test you'd typically want to try on your favorite porcelain!). Porcelain's impermeability means it's airtight, so it can be used to store loose tea. It won't absorb the essence of liquids it contains, therefore it's ideal for gaiwans, pitchers, teacups, and other teaware you may wish to use with multiple varieties of tea. Also, the thin body means it loses heat quickly, a desireable trait when you're brewing temperature-sensitive tea. Like other ceramics, porcelain may be glazed to decorate or strengthen the object, or left unglazed (bisque). When porcelain is glazed, the glaze is often clear to highlight its unique translucent character. The second Western category, stoneware, is also high-fired and very hard, but only semi-vitreous with a heavier, opaque, colored body (often brown or gray). Yi xing teapots are an example of unglazed stoneware, whose slightly porous nature allows those pots to absorb the essence of tea that's brewed within. Stoneware's thicker body also helps to retain heat. Finally, there's earthenware, which is fired at lower temperatures and is non-vitreous. Earthenware is made from clay with less silica, the substance that vitrifies during firing, so it's relatively soft and absorbent unless glazed. It has an opaque body that's easy to scratch, chip, or break. An inexpensive terracotta flowerpot is an example of unglazed earthenware, which generally isn't used for teaware. Like tea, ceramics reward a lifetime of study. There are many fabrication techniques (molding, sculpting, throwing on a wheel); glazing, firing, and decoration options; clay additives; and other characteristics that skilled artisans can manipulate. Writing from the tea perspective, we can only say that ceramics and tea complement one another superbly, and knowledge and appreciation of one is sure to motivate interest in the other. 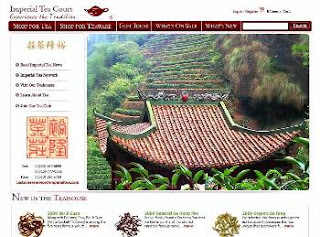 We just sent our latest newsletter, focused on our Most Intriguing Tea and Teaware of 2009. By intriguing, we mean the items you clicked on most frequently on our web site and in our newsletters. If you're ready to kick off your holiday shopping you'll find some great suggestions! Speaking of holiday shopping, shop in our online store before the end of the day Monday, November 30, and enter the coupon code HALFSHIP during checkout to receive half-price UPS Ground or USPS Priority Mail shipping on all domestic orders. It's one way we're saying Happy Holidays to all our favorite tea lovers! Be sure to subscribe to our email newsletter so you'll be the first to know about important news and special announcements. 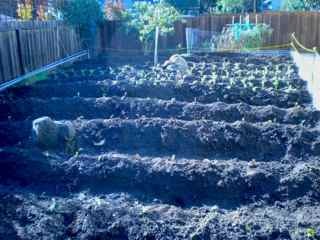 Roy reports that he's planted winter vegetables in his back yard. Next, the tea plants go in! In a month or so the homegrown, organic chard will be ready to serve to teahouse diners. The homegrown tea will take a few years longer. He's planning to plant several tea varieties. We'll keep you posted on how the garden grows, and let you know when we start serving Roy's homegrown vegetables in the teahouses. Roy invited me to join him at the teahouse Monday to try some of the latest samples tea farms and factories have shipped from China and Taiwan. He's been frustrated with many of the fall/winter harvest Taiwan oolongs he's tasted recently, because it's rained so much in Taiwan that aromatics and flavor haven't developed properly (oolongs need lots of sun, and too much rain also leaves the tea tasting thin and watery, no matter how much leaf you use). He didn't find anything he liked, so the search continues. We also tried a tie guan yin from Anxi, but compared to our current outstanding crop of Monkey-Picked Tie Guan Yin it was disappointing as well. With growing interest in tea worldwide and changing environmental conditions in China, it's getting harder and harder to find the great teas we stake our reputation on. Luckily Roy saved the best for last, an interesting new sheng puerh cake. Richly fruity without the sharp astringency of many sheng cha, this tea is pleasant to drink now and should age well in the dry conditions here in the Bay Area, with the sweet fruitiness continuing to concentrate and develop over time. We look forward to adding it to our online store in the next few weeks. If you're wondering what teaware our customers are choosing to brew their favorite teas of 2009, here's a roundup of our bestselling teaware this year. In keeping with the current economic climate, 2009's most popular gaiwan and yi xing teapot are practical and affordable, solid performers that deliver great value. Our sturdy, functional Teahouse Gaiwan is our customers' choice from our gaiwan collection this year. We like it too, that's why it's been our choice for service in our teahouses since 1993! The bright white color makes it easy to judge how your tea is brewing, while the wide mouth gives you lots of latitude for controlling steeping temperature. Plus the durable, commercial-grade construction means this gaiwan will remain your tea-brewing companion for many years to come. Best of all, we're currently offering a 10% discount on this item. This year customers welcomed the return of a long-time teahouse favorite, our attractive, traditional Contemporary Classic Yi Xing Teapot. This six-ounce pot is ideal for oolong or puerh tea and is made of excellent quality clay, yet it's an amazing value for a teapot of this quality. Available in either red or brown clay, it's a smart choice for anyone who appreciates the benefits of traditional gong fu tea. Finally, you can't brew tea without a kettle, and our Programmable Digital Electric Kettle, introduced early this year, has been a runaway hit among our tea-loving customers - it's one of our top-selling products for the entire year! Custom-manufactured to our specifications and UL-listed, it allows you to program in an exact temperature (not just a range like some other electric kettles), which makes it ideal for temperature-sensitive teas and meticulous brewing. It's also a great chef's accessory! The kettle is lined in stainless steel, holds approximately one liter, and is available in either dark teal green or black. Read about more Customer Favorites in our current newsletter. With a chill in the air we're all enjoying a bit more tea than usual this time of year. If you're looking for something different or perhaps a gift for tea-loving loved ones, here are some suggestions courtesy of customers of our online store: our top-selling teas of 2009. Green tea lovers are looking for healthy choices. Our customers' favorite green tea this year is Organic Everyday Green Tea, which offers an excellent flavor balance and rich texture on the palate. A healthful, forgiving, and easy-to-brew tea that will reward you with great taste almost no matter how you brew it. And it's affordable enough to drink every day! Year after year, our overall top-selling tea is Roy's hand-fired, traditional-style Monkey-Picked Tie Guan Yin. One pot of this fine, rare tea tells you why: it's a veritable symphony of fruit, florals, and fire, a rich and complex blend of all the elements that make oolong many tea lovers' preferred beverage in every season. Our top-quality tie guan yin is oxidized according to the time-honored formula "three hong (red) to seven lu (green)," in other words, until 30% of the leaf is reddish brown and 70% remains green. Roy performs the final firing here in the US to ensure maximum aromatics and flavor. Fans of this great tea will be delighted with the 2009 version, which features larger leaves packed with flavor; rich viscosity; a great balance of florals and firing; glossy bao guang ("treasured luster" - a sign of high leaf quality); and a rare and highly desireable reddish-orange liquor. Puerh lovers won't be surprised that Topaz Puerh is our bestselling puerh in 2009. We've had this tea in our warehouse since 2000, and if you know puerh, you know that's a good thing. The small amber tips brew up into a deep golden-red infusion with a rich, full, earthy taste that has the hearty yet mellow smoothness and sweet finish of fine, aged puerh. Here's a tea that never disappoints and just keeps improving with age, truly a customer favorite year after year. Our bestselling scented tea in 2009 is our renowned Imperial Jasmine Pearls, produced to our fanatically high standards, which include hand-wrapping each pearl in special cotton paper for optimal storage during the wait between the spring harvest of our fine green tea and the summer harvest of the best jasmine blossoms. Bursting with white tips, our pearls are almost snow-white and intensely fragrant with a rich-textured liquor. Jasmine tea is the tea most beloved in Beijing; you'll understand why once you've experienced our Imperial version of this classic. Rounding out our Customers' Choice teas, Imperial Yunnan Gold brings all the flavor and depth of teas of Yunnan Province to a delicious black tea. Made almost exclusively from the downy golden buds of Yunnan's da ye (large leaf) cultivar, this extraordinary tea yields a bright amber liquor upon infusion. Packed with flavor and hand-crafted by skilled artisans, it's a tea you won't soon forget! One afternoon recently an email arrived disparaging our Imperial Tribute Harvest Purple-Tip Puerh. The heckler (who never tasted our tea) found a “purple-tip puerh” online at a rock-bottom price and questioned the merits of our pricier flagship tea. The spirit of tea is all about being curious and open-minded, so I was immediately intrigued. Could Roy have wasted months negotiating and competing with Chinese buyers for the chance to acquire our rare tea, when he might simply have bought some online and far cheaper? I ordered one of the bargain “purple-tip” cakes to check it out. The cake arrived promptly, and when I mentioned it to Roy he recalled that one of his Chinese suppliers had also sent a sample of a putative purple-tip for his consideration. We decided to have a side-by-side “taste-off” at the warehouse. This afternoon we gathered the three teas and did a professional-style cupping under controlled conditions: five grams of each tea, infused in water at 205F for five minutes. First a word about the initial visual impression. You’ve seen our purple-tip puerh—we think it’s such a beautiful tea that we use its photo as the header for this blog! There are also several photos on the product page on our web site. It consists almost entirely of purple, gold, and greenish leaf tips that nestle inside one another like tiny bamboo shoots. Because it was picked very early, the petiole (attachment point between the leaf and the stem) is short and stubby. Older puerh leaves quickly grow long, thin petioles. The first thing we noticed about the cake we bought online was that it was green, not purple (perhaps as compensation, it came in a purple wrapper!). It consisted primarily of fully opened leaves with long petioles. Most of the leaves were covered in downy spring fur. As to the purple wrapper, it included a lot of English text, as well as Chinese. This is a bit of a red flag, as Chinese have been known for centuries to export tea they don’t care for to the West. Any Chinese packaging with English is clearly a product bound for export. Finally, we had a look at the sample tea Roy received from China. This is one of strangest teas I’ve ever seen. The bamboo-shoot-like tips were huge—three or four times the size of our tea—and covered in incredibly thick, shaggy fur, like a puerh Sasquatch. Roy said the thick fur confirms that it was picked early in the year, while the large leaf size suggests that it was grown at a lower altitude, with plenty of oxygen and rich soil compared to growing conditions up in the mountains. The fur also made him skeptical that the leaves came from truly ancient trees, because very old trees tend to put out leaves later in the season, without the protective fur. In any case, he agreed, he’d never seen anything like it! Then we had a taste. Our tea has a powerfully fruity flavor; if you tried it blindfolded you might think you were drinking an exotic juice. It’s clean and refreshing with a potent finish. But what about the two contenders? The cheap online tea looked ok in the cup, with a clear, light-amber liquor, but it had a puzzling lack of aroma or flavor. Even inexpensive green tea from Yunnan usually has lots of flavor, so the blandness was a surprise. Roy’s sensitive palate also detected some chemically off-notes, almost as though the cake had been stored near cleaning products. The furry tea was disappointing, too. There was an off-taste that vaguely recalled the way old books smell after they’ve been stored in the attic. We surmised that the tea had been in storage in hot, humid southern China, where the excessive fur absorbed too much moisture and perhaps started to mildew a bit. The moral of this story? If it seems too good to be true…well, your mom can finish that one for you. Caveat emptor. In times like these we can all use a bit more luck, and what better way to invoke it than by brewing tea? Extraordinary times call for extraordinary teapots, and with that in mind we're pleased to present three Lucky Teapots from Taiwan, whose innovative teaware never fails to attract the eye. All of the teapots are meticulously crafted from unglazed clay. They make great gifts, and don't forget to add one to your cart for yourself! In Chinese culture mice are thrify and industrious, and those embodied in our adorable Mouse Teapots are flaunting large, ancient Chinese gold coins to show the fruits of their labor! Whether you're born in the Year of the Mouse or just love these cute yet functional teapots as much as we do, you can start every tea-brewing session with a smile. Available in dark brown, terracotta, or tan spotted colors. The Chinese word for fish, yu, sounds like the word for abundance, so Chinese love fish in any form as a token of wealth and prosperity. Now you can summon abundance every time you brew tea with one of our irresistible Blowfish Teapots. Their round bellies suggest extra abundance and also give large oolong or puerh tea leaves plenty of room to expand, so your tea will be as delicious as it is fortunate. A must for any teapot collector! Available in dark brown or terracotta colored clay. Rounding out our Lucky Teapot collection (literally!) is the rotund Lucky Pig Teapot. Pigs are well known as symbols of luck and plenty in many cultures. Other people just think they're cute! Maybe you're even fortunate enough to be born in the Year of the Pig, one of the luckiest signs in the Chinese Zodiac. Whatever attracts you to this unique, well made teapot, you're sure to have good luck brewing tea, and start the day off right. Available in dark brown with gold Chinese characters, terracotta, or tan spotted. It's been a busy month here at the teahouse. First we shipped Roy's book off to the printer, and now we're working on the new and improved web site we hope to launch this month. The image at left is a preview of the new home page. In addition, in this year of great oolong tea, more good news for oolong lovers: the bounty continues! Last week Roy and I cupped some candidates from the crop of winter green oolong from Taiwan. Earlier this week Roy fired two more varieties of Wu Yi yan cha: the uncommon bai mu dan (white peony - a different tea from the white tea that goes by the same name) and the classic shui jin gui (golden water turtle), one of the si da ming cong (four great varieties) of yan cha. We'll be tasting those in a few days and I'll post a full report here on the blog. We're expecting lots of news in these last few weeks of the year, so check back often for updates! If you're a regular Camellia Sinensis reader you've no doubt noticed some changes to the blog and possibly a few intermittent glitches. These are related to a major redesign of the ImperialTea.com web site, due to launch in the next week or so. Among other improvements, we'll be integrating the blog into the main site. Until the official relaunch you may notice occasional strange looks or odd behavior. Thanks in advance for your patience. The new site will help us provide more information and serve you better, and we're eager to unveil it as soon as possible! In the meantime, if you have questions or need assistance, don't hesitate to contact us. This morning we did the final signoffs and Roy's upcoming book, Great Teas of China, is heading to the printer! Assuming all goes well from here, we should have copies in our warehouse in about four weeks. You can preorder the book on our web site. We're also trying to arrange e-book editions. More details on that as the situation evolves.